Access data on a wide range of memory cards using your USB-C enabled mobile device or computer. Ideal for creative professionals, this multi-card reader/writer saves you time and helps you work more efficiently when working with a wide variety of flash media, letting you quickly transfer and back-up files. It supports SD (Secure Digital), microSD, and CompactFlash cards, and connects to the USB-C port on your tablet, smartphone, laptop or desktop computer.The multi-card reader makes it easy to offload photos, video, and other files you've saved on your memory cards, providing fast access through USB 3.0 (also known as USB 3.1 Gen 1) with file transfer speeds up to 5Gbps. The reader increases workflow efficiency for creative professionals such as photographers and videographers. 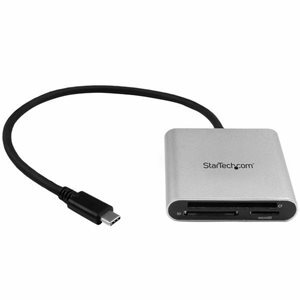 It helps to increase your productivity by saving you time when offloading raw images or editing video and photos, and backing up files.The card reader is also backward compatible with USB 2.0, ensuring compatibility with older systems.This multi-card flash reader gives you the flexibility and convenience of accessing multiple types of memory cards. It gives you read and write access to virtually any format of flash media card from your digital cameras or video cameras, with support for SD, SDHC (Secure Digital High Capacity), SDXC (Secure Digital Extended Capacity), microSD and CompactFlash cards. You can easily review files or back up and archive data from your smartphone, tablet, laptop or other USB Type-C enabled device. The three memory card slots for SD, microSD, and CompactFlash cards are all hot swappable, for additional flexbility.The card reader gives you a portable solution for accessing a wide variety of memory cards anywhere you go. With its small form factor, it fits easily into your pocket, backpack, briefcase or laptop bag. The integrated USB Type-C cable lets you quickly connect to a computer or pack it up quickly when you're done using it, without having to carry an additional cable with you. The card reader is powered directly from the USB port and supports plug-and-play installation, with no driver or software installation required. The multi-card reader makes it easy to offload photos, video, and other files you’ve saved on your memory cards, providing fast access through USB 3.0 (also known as USB 3.1 Gen 1) with file transfer speeds up to 5Gbps. The reader increases workflow efficiency for creative professionals such as photographers and videographers. It helps to increase your productivity by saving you time when offloading raw images or editing video and photos, and backing up files. The card reader gives you a portable solution for accessing a wide variety of memory cards anywhere you go. With its small form factor, it fits easily into your pocket, backpack, briefcase or laptop bag. The integrated USB Type-C cable lets you quickly connect to a computer or pack it up quickly when you’re done using it, without having to carry an additional cable with you. The card reader is powered directly from the USB port and supports plug-and-play installation, with no driver or software installation required.